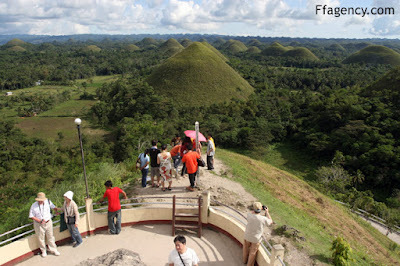 The Chocolate Hills are a famous tourist attraction of Bohol. It is featured in the provincial flag and seal to symbolize the abundance of natural attraction in the province. It is in the Philippine Tourism Authority's list of tourist destinations in the Philippines; it has been declared the country's 3rd National Geological Monument and proposed for inclusion in the UNESCO World Heritage List.